About Us, About the Company, What We Do, Contact Us Today! With unparalleled expertise, our seasoned salespeople will appraise your vehicle and work directly to help determine the best market value for your car or motorcycle. Period. V Fine Motor Cars is committed to establishing the fairest listing price possible to ensure that your car is driven off of our lot and you walk away with confidence! Our mantra is rooted in the word “vivificar” - to give life to, to invigorate - and we believe that every used luxury vehicle deserves to be acknowledged for the supercharged vessel that it is. We may be up and coming in the industry, but we’ve got years of long lasting appreciation for high performance vehicles behind us. We’re young, ambitious and believe every custom hot rod, high end luxury vehicle and everything in between is worthy of a revitalized new life when it’s driven off of our lot, because that’s just what we do - and we love doing it. 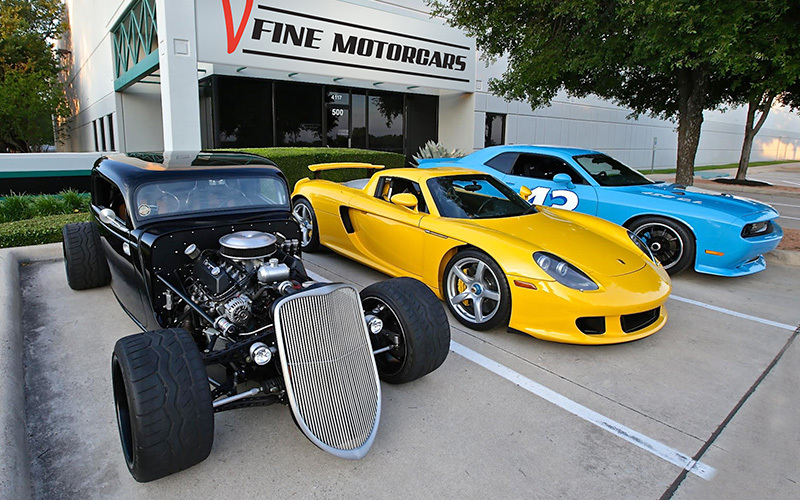 In Austin’s competitive luxury and exotic automotive and motorcycle industry, it can be hard to distinguish between which consignment dealerships truly have an appreciation for high end performance vehicles and those that are just looking to make a buck. Make no mistake - V Fine Motor Cars is the former, and has you and your car or bike’s best interests in mind. Give us a call today at (512) 825-5778. Thank you! Your form has been submited. We'll get back to you soon!